A few months ago, my sister in law challenged me to make a dish with squash and leeks. The second part of the challenge: it needed to be dairy free. Immediately, making a galette came to mind. Galette's are incredibly versatile. They can be sweet, savory, and topped with just about anything. They are like the pizza of the pastry world. Once you get crust-making down (and I know that can be justifiably intimidating for some), you can improvise like crazy with different fillings. If really hate making crust just buy a pre-made one. 5) It could be the main course, especially if you are having people over for brunch or lunch. Just serve it with a nice salad. This recipe was adapted from Gourmet Magazine . If you don't care whether it has dairy, I would replace the Earth Balance and Shortening with 100% butter as indicated in the original recipe, and I'd also add some kind of delicious cheese to the filling before it bakes. In a food processor, pulse the flour, Earth Balance, shortening, and salt until the mixture becomes a coarse meal. Drizzle ice water over the mixture and pulse until it just forms a ball. Be careful not to over mix your dough. If the dough is too crumbly, add slightly more ice water. Remove the dough from the processor and press the ball into a round disc. Wrap the disc in plastic wrap and refrigerate for at least 1 hour. The dough can be made up to a day ahead. While the dough is chilling, you can prepare your filling. Preheat the oven to 425°F. 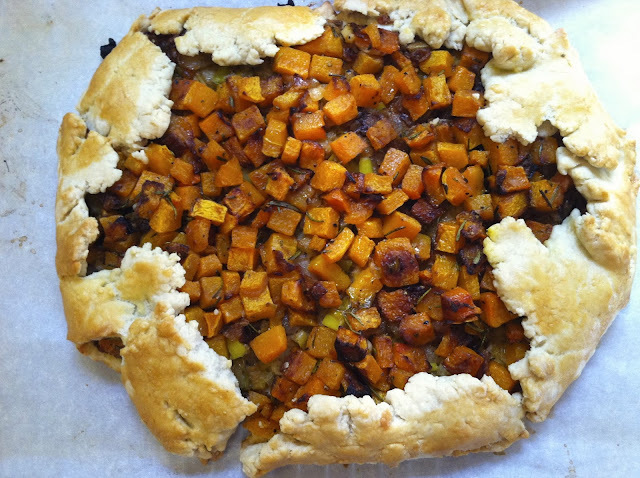 Place the cubed butternut squash on a lined sheet pan (you can use parchment paper or foil). Sprinkle the squash with freshly chopped rosemary, 1/2 a teaspoon kosher salt, and freshly ground pepper. Generously drizzle the squash with olive oil (about 2 tablespoons), and toss the squash with your hands so that each piece gets evenly coated with the oil, herbs and seasonings. Put the squash in the oven and bake for 20-25 minutes, or until the squash becomes tender and starts to become golden brown. Stir halfway through to ensure that the squash browns evenly. Once the squash is cooked, remove it from the oven and lower the temperature to 375°F. While the squash is roasting, prepare your leeks. Slice the leeks in half lengthwise and run them under cold water. Make sure you remove any grit that may be caught in the leaves. Thinly slice the leeks once they are washed and cleaned. Thinly slice a small sweet onion. Place a large saucepan or cast iron skillet on medium heat. Add 2 tablespoons of olive oil to the pan. Once the pan and the oil are hot, add the onions and leeks. Sprinkle 1/2 a teaspoon of kosher salt, freshly ground pepper, maple syrup and fresh thyme to the leeks and onion. Cook the mixture, stirring occasionally, for 10-15 minutes or until the leeks and onions become soft and golden brown. On a lightly floured surface, roll out the chilled dough into a 13-inch round. Carefully transfer the round onto a parchment lined baking sheet. Arrange the caramelized leeks and onions into the center of the dough, leaving a 2-3 inch boarder. Top the leeks with an even layer of squash. Fold the dough in on itself, covering the rim of the filling. You can make this as decorative or as rustic as you would like. Brush the pastry with the beaten egg. Bake the galette for 35-45 at 375°F, or until the pastry is golden brown. Remove and cool on a rack for 10 minutes before serving, or serve it at room temperature.